Black Shelties have a body coat consisting of solid black hairs. Black Shelties may be tricolor, in which case the dog has tan points on the cheeks and throat, inside the ears, above the eyes, under the tail and on the legs, below the black. Black Shelties may also be bi-color, in which case the tan points are absent. Both tricolor and bi-color black (bi-black) have varying amounts of white markings. CAUTION: Much of the older references on dog coat color uses the term bicolor to refer to a black (or brown) dog with tan points, and in these sources, the term bicolor pattern refers to the presence of tan points. 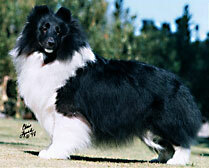 The tricolor and bicolor genes are two of the three Sheltie genes at the "a" or Agouti locus, sable being the third. Sable is dominant over tricolor, and both sable and tricolor are dominant over bi-color black. White marking are produced independently of the agouti series genes. The merle pattern can be superimposed on the black hairs of sable, tricolor and bi-black dogs to produce sable merles, blue merles and bi-blues. See the color inheritance page for more information.